Most anti-independence voters boycotted the ballot. The Spanish government is holding a special cabinet meeting to approve measures to take direct control of the semi-autonomous region of Catalonia. The meeting comes almost three weeks after the region held a controversial independence referendum, which was ruled illegal by the supreme court. Catalan leader Carles Puigdemont argues that the referendum result gave him a mandate to pursue independence. But Spain's government disagrees and is preparing to take back power. Catalan leader Carles Puigdemont says Catalonia will not accept Madrid's plan to impose direct rule on the region. He described it as the worst attack on Catalonia's institutions since General Franco's 1939-1975 dictatorship, under which regional autonomy was dissolved. Spanish PM Mariano Rajoy's plans include the removal of Catalonia's leaders and curbs on its parliament. It follows the independence referendum that went ahead despite being banned by Spain's Constitutional Court. Mr Puigdemont said the Spanish government was acting against the democratic will of Catalans after refusing all offers of dialogue. He said he would call for a session in the Catalan parliament to debate a response to Mr Rajoy's plans. Addressing European citizens in English, he added that the European Union's founding values were "at risk in Catalonia". What is the Spanish government planning? Earlier Mr Rajoy said he was triggering article 155 of the Spanish constitution, which allows for direct rule to be imposed in a crisis on any of the country's semi-autonomous regions. Speaking after an emergency cabinet meeting on Saturday, Mr Rajoy stopped short of dissolving the region's parliament but put forward plans for elections. He insisted that the measures would not mean Catalan self-government itself was being suspended - instead, he said, the plan was to remove those people who had "taken self-government outside the law and the constitution". The measures, which are supported by opposition parties, must now be approved by Spain's Senate in the next few days. Reports say that Spain's interior ministry is preparing take control of Catalonia's Mossos d'Esquadra police force and remove its commander Josep Lluís Trapero, who is already facing sedition charges. The government is also considering taking control of Catalonia's public broadcaster TV3, El País newspaper reported. The use of article 155 has sparked widespread criticism in Catalonia, where many say it amounts to a suspension of the region's powers of self-government. The Speaker of the Catalan Parliament, Carme Forcadell, called the measures a "de facto coup d'etat". "It is an authoritarian coup inside a member state of the European Union," she said, adding that Mr Rajoy intended to "put an end to a democratically elected government". Catalan Vice-President Oriol Junqueras said Mr Rajoy and his allies had "not just suspended autonomy. They have suspended democracy". Barcelona Mayor Ada Colau said it was a "serious attack on the rights and freedoms of all, both here and elsewhere". Iñigo Urkullu, the president of the government in Spain's semi-autonomous Basque region, said using article 155 was "extreme and disproportionate". However Inés Arrimadas, head of the centrist Ciudadanos party in Catalonia which is against independence, said holding fresh elections would "restore goodwill and democracy" in the region. Mariano Rajoy's use of Article 155 had been widely anticipated, but his announcement when it came still had a huge impact. The article has never been invoked before, so there was a certain amount of mystery surrounding its potential reach and meaning. Although Mr Rajoy insisted that Catalonia's self-government is not being suspended, many will disagree. The removal from office of Carles Puigdemont and all the members of his cabinet, to allow ministers in Madrid to take on their duties, amounts to a major reining in of Catalonia's devolved powers. The Spanish prime minister said that one of his aims was to restore peaceful co-existence to Catalonia with these measures. Many Catalans who want to remain in Spain will approve of this strident action. But those who want independence for their region are likely to see this as a provocation rather than a solution. It comes after the Catalonia regional government held a referendum on 1 October to ask residents of the region if they wanted to break away from Spain. Of the 43% of Catalans said to have taken part, 90% voted in favour of independence. But many anti-independence supporters boycotted the ballot, arguing it was not valid. He then defied two deadlines set by the national government to clarify Catalonia's position. The speaker of the Catalan parliament Carme Forcadell said Rajoy's decision to fire Catalonia's government and force a new election is a "coup" and an "attack against democracy". "Prime Minister Rajoy wants the parliament of Catalonia to stop being a democratic parliament, and we will not allow this to happen. "This is why we want to send to the citizens of this country a message of firmness and hope. "We commit today, after the most serious attack against the Catalan institutions since they were restored, to the defence of the sovereignty of the parliament of Catalonia. Catalan officials will not follow orders from the Spanish government, the foreign affairs spokesman has said, as Madrid moves to reassert control over the region. Raul Romeva told the BBC that the central question was not about independence but about democracy. Spain's Prime Minister Mariano Rajoy announced on Saturday plans to sack Catalonia's regional government. A referendum outlawed by Spain was held on 1 October in Catalonia. The Catalan government, led by President Carles Puigdemont, said that of the 43% said to have taken part, 90% were in favour of independence. "The people have decided democratically for years what is the government they want, what is the parliament they want. These institutions need to be preserved," Mr Romeva said. "No-one else but the people has the right to change those institutions." Mr Rajoy's speech was met with applause in the Spanish senate, where his Partido Popular has a majority. What is the Catalan parliament debating? On Thursday the Catalan parliament began discussions over a possible declaration of independence. It came after Catalan leader Carles Puigdemont failed to reveal a favoured course of action, and called on MPs to decide on a response. Mr Puigdemont signed a declaration of independence following the 1 October vote, but immediately halted implementation and called for negotiations between Catalonia and the Spanish government. During Thursday's Catalan parliamentary session, a government spokesman said a proposal to implement the results of a referendum on independence would be submitted to lawmakers on Friday. Hardline separatists continued their calls for an official declaration of independence. "We will continue on the path to a Catalan republic," said an MP for the far-left CUP, which provides key support for the pro-independence governing coalition. But Ines Arrimadas, leader of the anti-independence Citizens's Party, accused Mr Puigdemont of missing countless opportunities to resolve the crisis through negotiation. "You still have time to return to legality and call elections," she said. But on Friday the Spanish Senate is expected to vote in favour of triggering Article 155 and stripping the region of Catalonia of its autonomous powers. 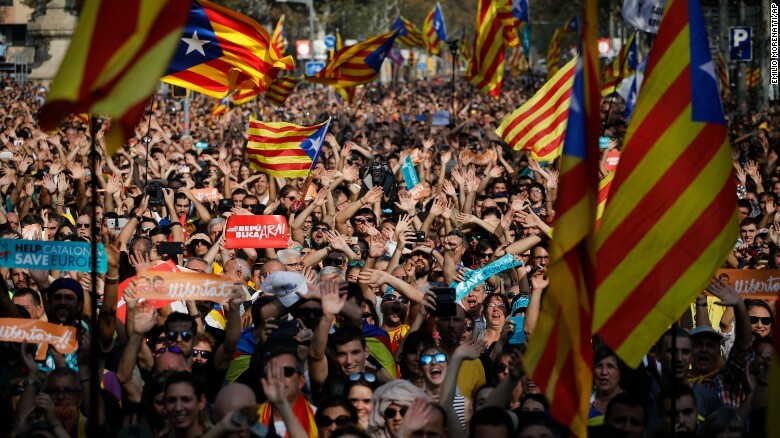 Barcelona, Spain (CNN)The Catalan Parliament voted overwhelmingly to declare independence from Spain on Friday, prompting the Spanish Senate to grant Madrid unprecedented powers to seize control of the autonomous region. The day's dramatic and fast-moving events pushed Spain into uncharted territory, testing the limits of the country's Constitution drawn up after the restoration of democracy in the 1970s. Supporters of Catalan independence gathered outside the Catalan parliament in Barcelona. The Spanish government called two Cabinet meetings for later Friday. Spanish Prime Minister Mariano Rajoy has pledged to quash the separatists, and moves to take over the Catalan administration are expected to begin at the weekend. Mr Rajoy said the unprecedented imposition of direct rule on Catalonia was essential to "recover normality". On Friday the Spanish Senate granted Mr Rajoy's government the power to impose direct rule on Catalonia, and after an emergency cabinet meeting Mr Rajoy spelled out what that would entail. A motion declaring independence was approved on Friday with 70 in favour, 10 against, and two abstentions in the 135-seat chamber. Several opposition MPs boycotted the vote. Afterwards, thousands took to the streets in Barcelona to celebrate, and Spanish flags were removed from some regional government buildings. Separatists say the move means they no longer fall under Spanish jurisdiction. Meanwhile Spanish prosecutors say they will file charges of "rebellion" against Mr Puigdemont next week. Catalonia is one of Spain's richest, most distinctive regions with a high degree of autonomy. But many Catalans feel they pay more to Madrid than they get back, and there are historical grievances, too, in particular Catalonia's treatment under the dictatorship of General Franco. Catalans are divided on the question of independence - an opinion poll earlier this year said 41% were in favour and 49% were opposed to independence. Spanish government has stripped Catalonia of its autonomy and taken charge of its government. The measures early on Saturday came after the Catalan parliament voted to declare independence on Friday. It did so early on Saturday by publishing an official bulletin (in Spanish) that dismissed Catalan leader Carles Puigdemont and all government members. Is Spain really a united country? Sacked Catalan leader Carles Puigdemont has called for "democratic opposition" to direct rule from Madrid. He condemned the suspension of Catalonia's autonomy and promised to continue to "work to build a free country". And Spain's interior ministry has taken charge of Catalonia's police after firing senior Catalan police officials. An official state bulletin (in Spanish) handed control of Catalonia to Spain's Deputy Prime Minister, Soraya Saenz de Santamaria. Demonstrations for and against independence went on into the night, and a large rally "for the unity of Spain and the constitution" was held in Madrid on Saturday. In his TV address, Mr Puigdemont, describing the declaration of independence, said Friday had been "a day with democratic and civic sensibility". He said the central government's actions since then were "premeditated aggression" that ran "contrary to the expressed will of the citizens of our country, who know perfectly well that in a democracy it is parliaments that choose, or remove, presidents". He added: "We continue persevering in the only attitude that can make us winners. Without violence, without insults, in an inclusive way, respecting people and symbols, opinions, and also respecting the protests of the Catalans who do not agree with what has decided the parliamentary majority." Meanwhile, the Spanish government has said it would welcome the participation of Mr Puigdemont in new elections in the region in December. A Spanish government spokesperson, Íñigo Méndez de Vigo, said that despite his removal from office, the separatist leader had the right to continue in politics. "The Catalans will be able to say what they feel about what they've been seeing in this last year, with all sorts of failing the law, abusing the law and putting themselves outside the law," the spokesman added. Catalonia’s ousted regional president will give a news conference in Brussels on Tuesday, European officials said, as speculation mounted that he might seek political asylum in Belgium and try to avoid possible prosecution in Spain for declaring Catalan independence. Carles Puigdemont arrived in Brussels on Monday, the same day that Spanish prosecutors announced they were seeking rebellion, sedition and embezzlement charges against him and other Catalan officials. Spanish Foreign Minister Alfonso Dastis said that the central government in Madrid would be surprised if Puigdemont sought asylum in Belgium and were granted protection there. Dastis told Spain’s Cadena SER radio that there is a level of “reciprocal trust” about the rule of law among members of the European Union. Spain took control over prosperous northeastern Catalonia this weekend after Puigdemont led the regional parliament to proclaim a new republic on Friday. The Spanish government immediately sacked him and his Cabinet, dissolved the regional parliament and called a new Catalan election for Dec. 21. Meanwhile, Spain’s Supreme Court said Tuesday it will investigate six ex-members of the governing body of the now-dissolved Catalan parliament for possible charges of rebellion, sedition and embezzlement following the parliament’s declaration of independence last week. The six include ex-speaker of the parliament Carme Forcadell, one of the leading activists of Catalonia’s pro-independence movement for many years. The ruling Tuesday came a day after Spain’s chief prosecutor Jose Manuel Maza announced he was seeking charges. Rebellion, sedition and embezzlement charges carry maximum sentences of 30, 15 and six years in prison, respectively. Maza is also seeking similar charges against ousted regional leader Carles Puigdemont, and his No. 2, Oriol Junqueras. Sacked Catalan leader Carles Puigdemont will not return to Spain to answer charges including rebellion, his Belgian lawyer has said. Speaking to the Associated Press, Paul Bekaert suggested Mr Puigdemont should instead be questioned in Belgium where he has been since Monday. He has been summoned to court in Madrid on Thursday, alongside 13 deputies. They face charges including sedition and misuse of public funds over last month's banned independence referendum. Spanish prosecutors could order their arrest if they fail to appear in court for questioning. But Mr Bekaert told Dutch and Belgian media that his client would "wait and see" further reaction from the Spanish authorities before returning because of the "high" risk of detention. He also suggested he would fight any extradition ordered by the Spanish national government. Spain has been gripped by a constitutional crisis since a referendum, organised by Mr Puigdemont's separatist government, was held on 1 October in defiance of a constitutional court ruling that had declared it illegal. After the regional parliament declared independence, Spain's took direct control and sacked the government, including Mr Puigdemont. On Monday, Spain's chief prosecutor said the Catalan leaders were accused of rebellion - which carries a maximum 30 year jail term - as well as sedition and misuse of funds. The leaders are yet to be formally charged but are due to testify at the Audiencia National (National Court) on Thursday and Friday. Both Mr Puigdemont and his lawyer denied at a news conference on Tuesday that he had travelled to Belgium to seek asylum. He said he was there "for safety purposes" and wanted to be able to speak freely. Joaquim Forn and Dolors Bassa, the deposed Catalan interior and labour ministers who travelled with the former Catalan president to Belgium, returned to Barcelona on Tuesday night. They were greeted by chants of "off to prison" by some crowds that had gathered at Barcelona international airport, according to media reports. Mr Puigdemont previously said he would return to Spain if he and his colleagues received guarantees of a fair trial from the Spanish government. Sacked members of Catalonia's regional government are appearing at Spain's high court to face rebellion and sedition charges, after October's disputed independence referendum. But ousted Catalan leader Carles Puigdemont and four others have stayed away. Prosecutors could order their arrest. Mr Puigdemont, who is now in Belgium, said: "This is a political trial." On Monday, Spain's chief prosecutor said the Catalan leaders were accused of rebellion - which carries a maximum 30-year jail term - as well as sedition and misuse of funds. They were ordered to appear in Madrid's Audiencia National (high court) on Thursday morning for questioning. Who has showed up - and who has not? Mr Puigdemont had previously said he would not return to Spain if he and his colleagues did not receive unspecified guarantees of a fair trial. His Belgian lawyer told Reuters news agency that he would co-operate with the authorities, but did not appear before the judges because "the climate is not good". The four other sacked leaders who failed to show up at the high court also stayed in Belgium, La Vanguardia newspaper reported. Mr Puigdemont's handling of the crisis has drawn criticism among some other Catalan politicians, with left-wing parliamentary deputy Joan Josep Nuet saying his absence could make matters worse for those who followed the court's order. "The attitude... has been really absurd, managing only to create yet more bewilderment," he told Catalunya Radio. Among those who showed up were the sacked deputy leader Oriol Junqueras, Interior Minister Joaquin Forn, foreign affairs chief Raül Romeva and spokesman Jordi Turull. Despite Mr Puigdemont's position, the Spanish government insists it has no influence over the country's judiciary, the BBC's Tom Burridge in Barcelona says.